The highly anticipated 23th edition of the LA FILM FESTIVAL produced by FILM INDEPENDENT arrives this year and runs from June 14-22, 2017. This years collection of cinematic wonder will include feature films, shorts and other media presentations from over 30 counties around the world. All films that are screened at the LA FILM FESTIVAL become eligible to receive numerous awards including The Academy Awards in Narrative, Documentary, Short and Animated categories, The Film Independent Spirit Awards (feature length) and Cinema Eye Honors for non-fiction filmmaking (documentary feature length). This year special guest film director MIGUEL ARTETA will receive the prestigious Independent Spirit Award for his contribution to cinema. Arteta will be delivering a keynote speech at the filmmaker retreat prior to the festival. His latest film “Beatriz At Dinner” written by MIKE WHITE + starring SALMA HYAK and JOHN LITHGOW opens in theaters Friday. Also highlighting the festival special events is the – DIVERSITY SPEAKS – FREE events that takes place Saturday, June 17 and Sunday, June 18 in the Kirk Douglas Theatre in Culver City. Diversity Speaks will feature five in-depth panel discussions aimed at expanding the definition of diversity and act as a call-to-action presented by well known and successful creators in the industry. 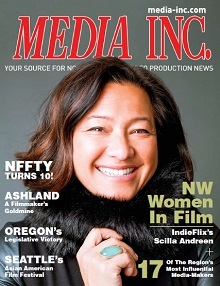 MEDIA INC MAGAZINE will be on the ground covering the festival + Red Carpet via LIVE twitter + daily interviews with filmmakers. Keep an eye out for our exclusive coverage of #WomenInFilm – As we ill be Showcasing works of the festivals talented Women filmmakers + creatives + special guests. Be sure to follow @MediaIncMag on TWITTER (Click to Follow) for round the clock 24-hour updates on the entire Festival! Here’s MEDIA INC MAGAZINE’S guide on ‘How to – LA FILM FEST’! Where to get your Tix and Passes. The ARCHLIGHT in Culver City is Festival Headquarters and main ticketing center. There are numerous ways and outlets to purchase + pick up. Best way is to click here on TICKETS or PASSES and you’ll be set! Plan well ahead for parking and lines. The SANTA MONICA Archlight Cinema is DA BOMB for shopping + quick 5 minute walk to the Santa Monica beach! Be kind to all the festival staff and volunteers Ya’ll:) They have worked VERY hard this last year to make this spectacle very special for all of us to enjoy. See you in LA! Download the IFC App for your smartphone and devises to catch great films! Previous PostThe 2017 Great American PitchFest June 23-25 | Announces Line-up + Schedule!Next PostSeattle International Film Festival 2017 Awards announced!